Ready for a cycling ADVENTURE? Surge, sprint, attack, this is what Scatto means in Italian. Will you be able to make that final “scatto” up to your luxurious hotel after a tough/exhausting day cycling along our secluded yet challenging roads across historic Italy? We offer physically challenging bike tours for small groups of guests. Break away from mass tours, opt out of well known bike routes. Place yourself in the hands of expats who have committed their lives to bikes and Italy. Our tours are not for the fainthearted. Be prepared to put in the effort, but we will be there to make it a pleasurable experience…every pedal of the way. We take the back roads and will show you the real Italy...off the beaten track. With us you will receive the best possible assistance. We have an experienced mechanic and our specialist masseur, who has worked for professional cyclists. Food and accommodation is unique. This is not about mass comfort or chains. This is about finding a unique experience, a villa hidden in a hillside, a restaurant where mamma still cooks. Scatto is run by expats who have lived in Italy most of their lives… they know their way around Italy. "Even though I am Canadian, British and Austrian, I have lived in Italy nearly all my life and feel more Italian than anything else. Cycling has been always been part of my life and I have worked in the industry for more than 25 yrs. I created Scatto because Italy has some of the most beautiful cycling the world has to offer, not to mention the food and wine, and I wanted to bring some of my friends over to visit. A Scatto tour will challenge you but at the same time you will enjoy a luxury trip and visit some of the most beautiful places on earth." 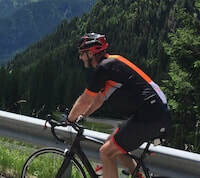 Like Steve Jobs once said, "People don't know what they want until I give it to them....." well I did not know what I wanted in a cycling tour until Scatto gave it to me. Truly an experience you will never forget. Charlie put together a trip based on our group’s specific interests that exceeded our expectations in just about every respect. Charlie had it covered. We found Charlie and his team to be highly professional, well organised, adaptable and easy going.